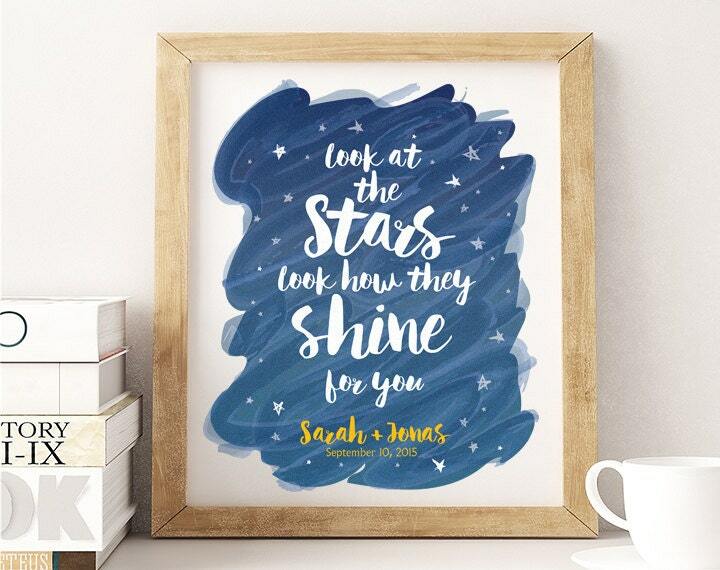 A custom personalized poster design featuring starry night art that features the quote "Look at the Stars, Look how they shine for you." On the bottom, it's personalized with your names and wedding or anniversary date. The names and/or the wording color can be changed. Once I receive your order, a PDF proof will be emailed to you in 1-3 business days. I will work with you until the design is absolutely perfect for printing! Option 1: Printable PDF Only - This digital option can be created at any size, and as a poster or announcement. Your final product will be delivered via email as a high resolution print-ready PDF and a JPEG. This option includes free Priority Mail shipping and is available within the US only. Please allow for 3-5 business days for production/shipping after proof is approved. - Color choices (the above chart includes commonly picked colors, however, I would be happy to match any color at all! I look forward to working with you to create your custom art print! If you have any questions, please feel free to contact me, sameeha [!at] theinkedleaf.com or 443.297.9424. This looks even prettier in person! The seller was very responsive, communicated quickly, and even followed up when she saw my order was received. I truly enjoyed working with her. I absolutely love the print. The seller was amazing to work with and I would definitely work with her again!